As promised, here are some more details on the food I cooked on Saturday night. Here's the menu again, if you don't fancy clicking back and forth. I love reading Fanny's blog, and admiring her pretty patisserie creations, but had never though of making anything from it! Until I saw this recipe. It's not difficult, but it is very time consuming, and the work will need to be spread over a few days. First things first: the pineapple. You start by making a caramel out of sugar, a vanilla pod, and water. (Dangerous, splattery fun!) Then, mash a banana into it, let it cool, then refrigerate it overnight. The next day, chop up a pineapple, and roast the pieces in the caramel for an hour in a super-hot oven. Needless to say, BE CAREFUL with the hot sugar. It will be hotter than the sun. Once the pineapple is cool, you can put it in a container, cover it and refrigerate it. I tried a sneaky piece with some Greek yoghurt - delicious! Now, the sweet shortcrust pastry. I won't go into too much detail, the method is explained very well, in cute step-by-step pictures, on Foodbeam. Even though I habitually make pastry in the processor, I could follow it. 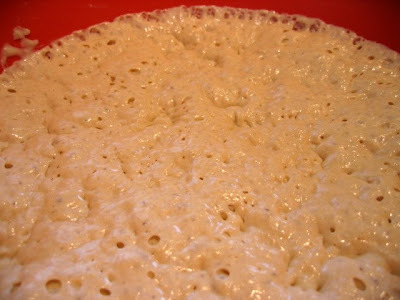 The dough needs a lot of resting - overnight, then for 2 hours once it's rolled out, then again for an hour once you've lined your tin. Phew! Having said that, it's quite simple to make, and if you follow the instructions carefully and don't overwork the dough, the result will be lovely and crisp, and won't shrink when you bake it. 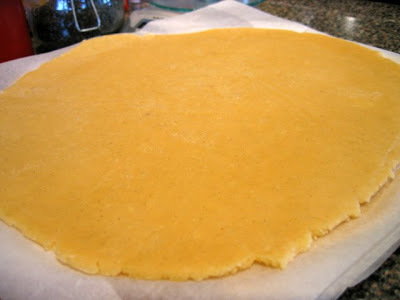 Beating butter with vanilla seeds to make dough. I made the dough 2 days in advance, and did all the rolling, lining and blind baking on the day of the dinner party. Rolled out pastry. Also vanilla-flecked. Unlike the 8-cm round shells that Fanny recommends, I used these heart-shaped tins I bought at Aldi in Germany, for a mere 5,99€. (You may remember them from such posts as Germany 2008: Was habe ich gebacken?). You will notice that I didn't trim them neatly, thinking that they would shrink in the oven. How wrong I was! No shrinking occurred. Remember, don't overwork the dough! The filling is supposed to be a milk chocolate ganache with strained passionfruit pulp. Now, in the 4 days leading up to my dinner party, I couldn't find passionfruit that were both cheap AND good. Even at the market, they were $1.50 each. So I just couldn't justify buying the 10 that I would need for the recipe. Sigh. I'll have to wait for summer, or until I can plant my own one in the backyard! So, the passionfruit-less ganache is just melted milk chocolate, cream, and butter. Amazingly, it didn't split, and it made the right amount of filling for my 12 pastry cases. I left them in the fridge while I got on with the rest of the meal, and after dinner I chopped up the pineapple, topped the tarts and we dug in! I really loved the texture of the ganache, but alas, the little tarts were way too rich! Even though these heart-shaped ones were smaller than the original recipe, the ganache was too intense. Of course, I managed to finish mine, but I noticed that my friends were struggling. I think that the tartness of the passionfruit would be lovely in it. Next time! Blinis!I thought these would be the simplest thing to make, but I was wrong. I've even made it a couple of times before. Just mix the ingredients together, let it rise in the fridge overnight, and fry small spoons of the mixture the next day. Sounds simple? Well, it is. I just screwed it up. When I took the batter out to fry in the morning, it smelled more sour than it should have been. Silly me thought that was just the yeast smell, and started frying a few up anyway. Still a bit suspicious, I tried one to make sure. And promptly spat it out. It was absolutely disgusting, totally feral. Sour and off and just plain wrong. YURGH. Big bowl of sour crap. On reflection, I think the milk must have been off, to produce such a foul concoction. I binned the lot, and rushed down to Leo's with my dad to get more buckwheat flour. As a consolation, dad felt sorry for me and bought me a packet of vanilla bean sweet shortcrust Carême Pastry. Can't wait to try it and compare it to the homemade! 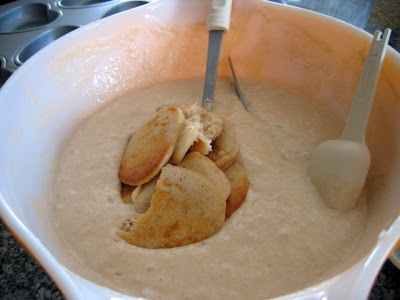 Anyway, we got home, I made another batch of the batter, with all fresh ingredients. I let it rise at room temperature for 2 hours. No worries! So, I fried up the new batter, and set them out on a board with bowls of the accompaniments - sliced red onions, capers, crème fraîche and smoked salmon. Done and done. For the nuts, it's very simple. Nigella says to toast them in the oven, then pour melted butter and spices over, but I find that too annoying. I always measure all the nuts out in advance, and toast them in a frying pan all-together with the butter and herbs 5 minutes before my guests are scheduled to arrive. Our main meal was the delicious anglicised involtini, from How to Eat. This was also a laborious undertaking. You have to slice and grill eggplants, then make a filling, roll up the filling in the eggplants, put them in a tray, pour over tomato puree and bake it. I grilled and filled the eggplants the night before, and left them gladwrapped in the fridge. All I had to do on the night itself was pour the tomato puree over, and bake! Filling - provolone cheese cubes, egg, parmesan, nuts, currants, breadcrumbs.. I love the involtini. Highly recommended! Ta-dah! All done! I love cooking, and really enjoyed trying out all the new techniques and so on, but I was so knackered by the end of the dinner party! I think the next time I have friends over, it'll be pizzas and beer in front of the telly. I feel tired from reading about all the work. That's a lot of effort. I've done a few dinner parties too but mainly I try to keep it fairly simple and have things that can be done in advanced. Having said that, it still takes a whole day and I wonder if it's just easier to do BBQs in future. But then I have the contradiction of trying new recipes and creating something fantastic that people will enjoy. Hi Laura - thanks! I actually like the taste of buckwheat flour, cos I love soba noodles! You're right about all the effort! I loved trying out all the new recipes, but it was very tiring. I suppose I should be building up a repertoire of easy entertaining recipes, so that each time I can try a couple of new ones, and do a couple of old ones. Hey, and even though BBQs are easier, I don't think anyone would enjoy them any less! I love BBQs!